Argent, a pithon erect and on a chief sable three Maltese crosses argent. 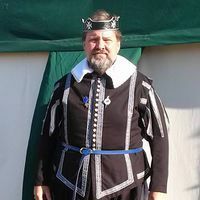 Greetings- I am Master Collin Monro of Tadcaster, 3rd Baron of Iron Bog. I first found the SCA at a Renaissance Fair back in 2000. Fencing was my first love in the SCA, but I have come to find many parts of our Society now ingrained into my being. Archery, running events, and the friends I have made will keep me active for a long time. I am one of the founding members of the Tadcaster Militia. Tadcaster is a tight group of friends who share a love of rapier. Over time, the household has also evolved to become a group of service junkies, with Kingdom Officers, Landed Baronages, and Peers included among our ranks. Former Queen's Champion of Rapier. This page was last edited on 16 April 2018, at 20:34.